Congratulations on selecting Mautic for your marketing automation needs. This step-by-step checklist will help you set up your Mautic account. A custom domain ensures that any Mautic landing pages have your URL in the address window of a visitor’s browser. By completing this step, a landing page URL would be something like https://m.mywebsite.com/page/1 instead of https://mywebsite.mautic.net/page/1. This ensures a seamless branded experience for your site visitors. The second part of this step is to update the DKIM and SPF records wherever your domain is registered. Don’t worry! It’s not hard to do, but you may need to ask your IT department or web developer to do this if you don’t have access to the domain settings for your website. Both of these are recommended in order to help prevent mail sent on your domain’s behalf from going to spam. You can watch detailed example videos on this topic at https://mautic.com/help/email-deliverability/. You can also read more about DKIM and SPF at How Do I Set Up SPF, DKIM, and a Sender Domain to Ensure Deliverability. 1.1 Log in to Mautic.net – https://mautic.net/login using the credentials you used when registering. 1.2 Click the edit button to the right of the account you’d like to update. 1.3 Click into the Custom Domain field. 1.4 A custom domain is usually a subdomain, something like m.mywebsite.com or info.mywebsite.com. Fill in the Custom Domain field with the subdomain you have chosen. If you have not yet added your Sender Domain, add that now (this is usually the URL of your main website). 1.6 Once you click Update, you’ll see a new red “Validate Domain” to the right of your account. 1.7 Click on Validate Domain and a modal will appear with instructions on how to set up your DNS records. – Recommended: The CNAME Record should have a name of (in the above example) m under mydemos.site that points to mautic.net. – The IP address for the ‘A’ Record (104.197.196.164). 1.10 Set up a custom domain at your web host. You may need your IT department to help with this. If you set up a custom domain in step 2.5, you must now create this sub-domain at your web host. Unfortunately, web hosts differ on their approach to this, so you’ll need to consult their documentation. Mautic recommends creating a CNAME record. The advantage of creating a CNAME Record over an A Record is an A Record will point to a specific IP Address, and if that changes, the A Record will need to be updated. A CNAME Record points a name (the subdomain you’re creating) to another name (in this case, mautic.net). This makes management easy, because if the IP Address ever changes, you won’t have to update the CNAME Record. The video tutorial in step 2.13 offers two tutorials: GoDaddy (video 3) and a standard cPanel setup (video 4). This must be completed before Mautic can validate the domain. 1.11 Update the DKIM and SPF records at your web host. The same information from 2.9 applies here. Watch the video tutorials or consult your web host’s documentation. Updates to domains like this can take up to 24 hours to be available across the web. 1.12 Once you create your DNS records and enter the DKIM and SPF records indicated, click the Validate Domain button again. Once all the records are recognized, you’ll get a success message and the button will convert to green. (Again, this might take up to 24 hours to work upon receiving the green validation). 1.13 If successful, click OK and head over to your Mautic account at your new custom domain! (the old URL will continue to work as well). 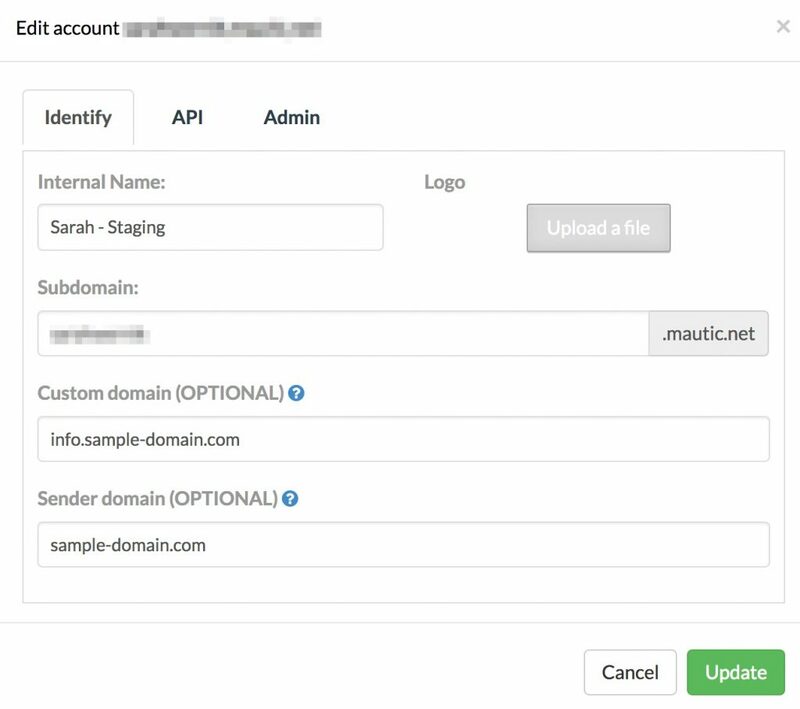 1.14 To view a video tutorial on Custom Domains, DKIM and SPF, head over to https://mautic.com/help/email-deliverability/. Once this is set up, you should ONLY log in using the custom domain. It will prevent a number of issues later on. 2.1 Enter the URL to your Mautic account. If you set up your custom domain, enter that into the address bar of your browser. If you have not done that, it will be something like my-account-name.mautic.net. (Replacing my-account-name with yours). You should have received this with your welcome email. 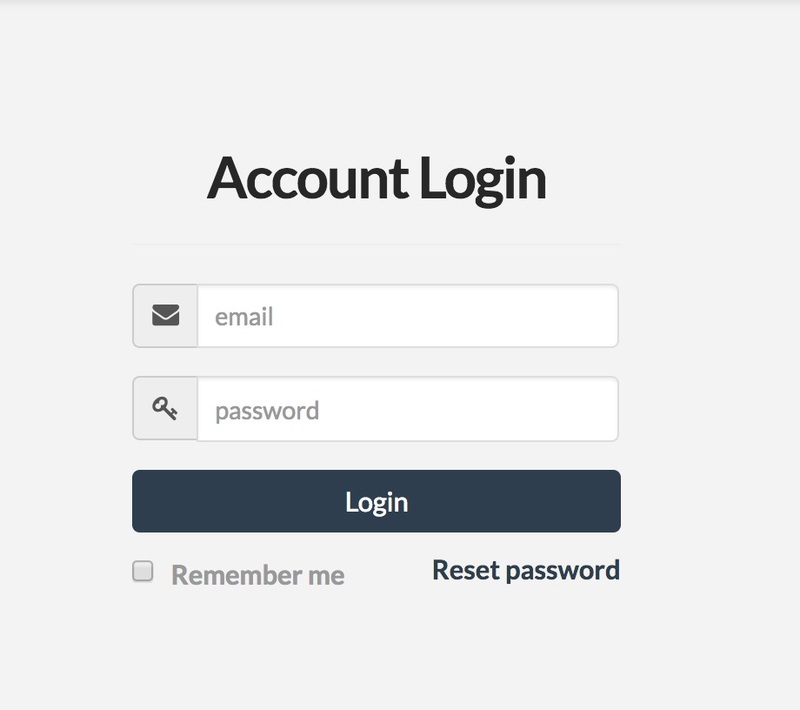 2.2 Log in using your username and password. If you are the primary person on your Mautic account, you are an Administrator, which gives you access to every area of Mautic. 2.3 Congratulations! You’re now inside your Mautic account and can start exploring. 2.4 Wouldn’t it be great to invite some of your colleagues to join you as you explore? You can do this by setting up some roles and adding users. 3.1.1 Click on the settings gear in the top right corner. This is where you’ll configure much of Mautic, including any email configuration, time zones, language settings, as well as any integrations you want to use such as a CRM like Salesforce (we’ll talk more about that later). 3.1.3 On the Details tab, enter a name for the role you’re creating. Let’s call it “Contact Manager”. This role will be for someone who is only responsible for managing the Contacts in Mautic. Leave the “Has full system access?” button set at “No”. 3.1.4 Click on Permissions and then Contact Permissions. 3.1.5 Check “Full” under both Contacts and Segments. This will allow anyone with this role to completely manage the contacts in Mautic, but not other elements such as emails. 3.1.6 Click Save and Close. 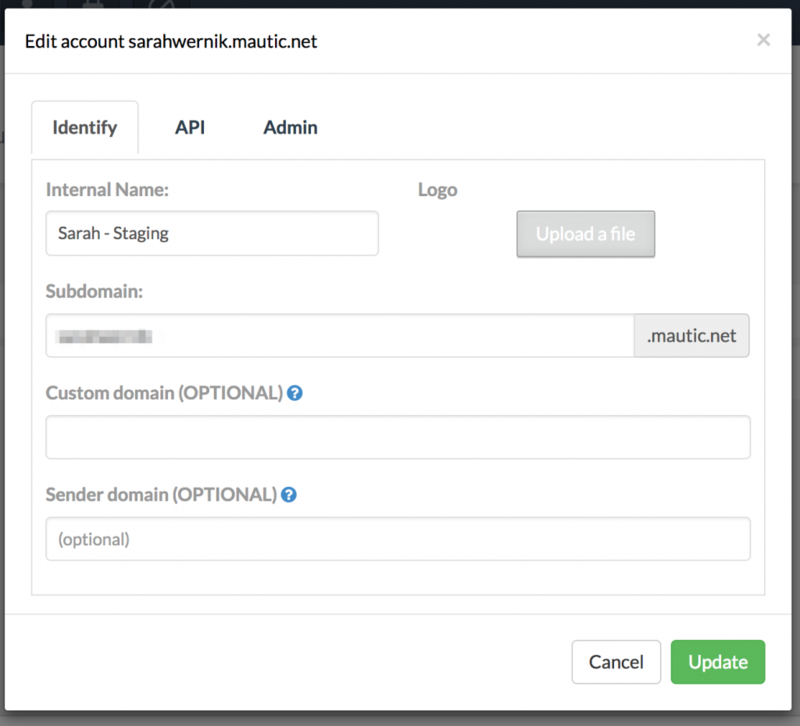 You’ve now created a role that allows anyone assigned that role to manage Contacts in Mautic. 3.2.1 Once a role is created, you can add a user to that role. Click on the Settings gear again, and click on Users. 3.2.4 Fill in the required fields (any field with a *) for your user, but choose Contact Manager from the Role dropdown. 3.2.5 Click Save and Close. Cross-origin resource sharing (CORS) is an internet authentication system that allows one website to request resources from another. When your website requests something like dynamic content from your Mautic account, it needs to “prove” that it has the right to do so. We highly recommend this step be taken even if you do not anticipate using all the features of Mautic. 4.1 Click on the Settings gear again. 4.3 Scroll down to the CORS section. 4.4 Click “Yes” to turn it on. 4.5 Enter your website in the Valid Domains box. 4.6 Scroll back to the top and click Apply. Frequency rules are a set of rules used to define the number of times a contact should be contacted by any means in Mautic. For instance, if a contact is in multiple campaigns and unfortunately scheduled to receive multiple emails in one day, frequency rules will prevent that from happening and spread the emails out so the contact isn’t bombarded with emails. 5.1 If you are still in the Settings area from the last section, click on Email Settings. If you went back to another area of Mautic, click on the Settings gear, then Configuration and then Email Settings. 5.2 This setting is up to you and depends greatly on your type of business. If you feel once a day is enough, put a “1” in the field and select “day” from the dropdown. Alternatively, you can put a “10” in the field and select “week” from the dropdown if that is more appropriate to your scenario. The key here is to never overwhelm a contact so they unsubscribe. By default, if a contact unsubscribes from an email from you, they are actually unsubscribing from all forms of contact from you. They are not deleted from your “known contacts”, but they will not receive anything more from you on any channel. By configuring the Preference Center, you can offer a more specific approach. 5.3 Scroll down to the bottom of the email settings page. 5.4 In the Unsubscribe Settings area, click Yes on “Show contact preference settings”. 5.5 You now have a choice as to how you’ll manage your marketing channels. If you use “contact’s categories” to manage unsubscribes, and change “Show contact’s categories” to yes, any public category that a contact belongs to will be displayed on this page. They will be able to unsubscribe from that category. If you use “contact segments” to manage unsubscribes, and change “Show contact segments” to yes, any public segment you create will be displayed here. Either way, this takes some planning as you begin to use Mautic. For this exercise, we’ll use segments. This can be easily changed later. 5.6 Click on Yes for “Show contact segment preferences”. Later, as you create segments, you’ll want to make sure to leave any segments you don’t want to show up here as private. 5.7 Click on Yes for “Show contact frequency preferences”. This allows a contact to manage the setting we created in 6.2. 5.8 Click Save and Close. Global categories are a way to group audiences that will receive fundamentally different marketing communications. Products, Personas, Geography could all be examples of global categories. As discussed above, this enables you to show the category that a contact is assigned to on the preferences page if you so choose. Using a combination of segments and categories will allow users to manage their own preferences. 6.1 Click on the Settings gear and click on Categories. Before contacts can be added or imported, you must identify the information you want to store in Mautic and add the additional fields in the Configuration area. This must be completed before you try to import contacts via a CSV file or an integration with a CRM (see the next section). Mautic supports all database field types and comes with some pre-configured special fields you can add to your contacts. You can add an unlimited number of fields to contacts in Mautic, however, you should add only the fields you need. Integrating with your CRM enables you to send contacts from Mautic to a sales team to follow-up. The integration also enables data to be brought back from your CRM system to Mautic so that marketing campaigns can be triggered from data captured in the CRM. You can choose as many as you need. The requirements for each are unique and help available on each plugin screen. Mautic comes with a number of plugins that you can use. Plugins are typically used to transfer data to and from Mautic. You can choose as many as you need. The requirements for each are unique and there is help available on each plugin screen. For instance, Mautic supports an integration with Citrix tools such as GotoMeeting. You can learn more about the Citrix plugin at https://mautic.com/help/citrix-plugins/. If you want to send tweets in a campaign, enable and authenticate the Twitter plugin. 10. Add the tracking script on your website. In order for Mautic to track click throughs and embed forms on your website, some code must be inserted into your site. If you are using WordPress, Joomla! or Drupal, you should install a plugin. If you are not using one of those content management systems, skip down to 10.2. Once again, you may need help from your web designer or IT department. 10.1 Depending on the content management system you’re using on your website, go to either the WordPress plugin page, the Joomla! plugin page or the Drupal module page (make sure you download the correct module for your version of Drupal). Download the plugin/module you need, and install it on your site. You’ll find the instructions on how to set up and use the plugin on the download page. 10.2 If you are not using one of those content management systems, then you’ll need to embed the tracking code or pixel on every page you want to track. 10.2.1 Click on the Settings gear. 10.2.3 Click on Tracking Settings. 10.2.4 Select the contents of the gray box and paste it into the pages you want to track on your website. Often you’ll have a page that’s included on every page load. You should paste the code into that page so Mautic can track everything on your site. Again, you may need the help of your web team or IT department for this step.